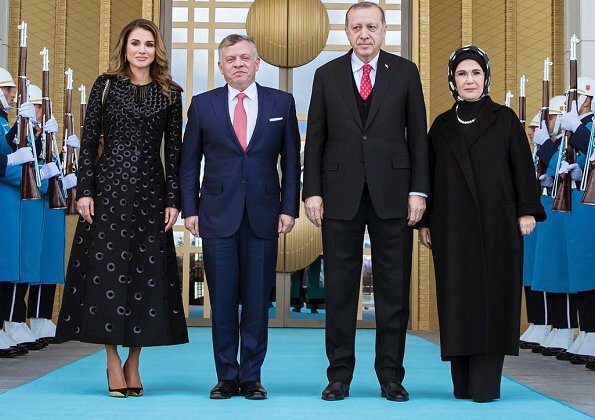 King Abdullah II and Queen Rania are presently making an official visit to Ankara upon invitation of President Erdoğan. Prior to their meeting, President Erdoğan welcomed King Abdullah II of Jordan into the Presidential Complex with an official ceremony. 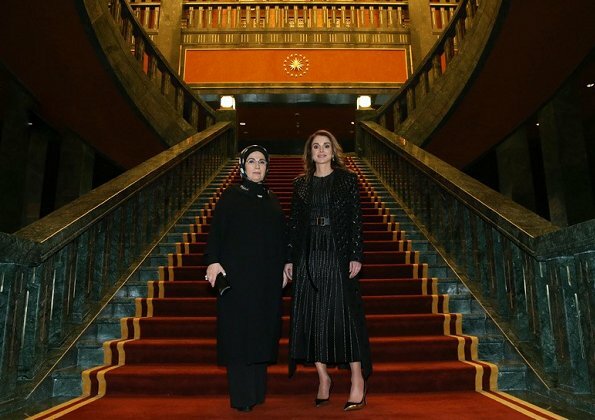 First Lady Emine Erdoğan and Queen Rania of Jordan were also present at the ceremony. Queen Rania met with First Lady of Turkey, Emine Erdoğan. The Queen and First Lady discussed common interests during a tour of the Presidential Palace. A bit scary, these pictures. Especially the one on the stairs. I wish a bit of colour for good coat. Not today... although generally I like her unconventional choices, this outfit is too baroque and dark for me.